This manual covers skills that students need to know to give immediate care to a suddenly injured or ill person until more advanced medical personnel arrive and take over. 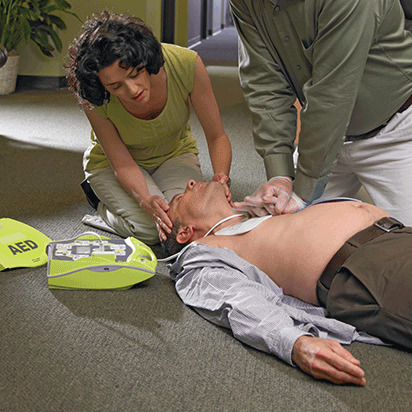 First Aid/CPR/AED Participants Manual is rated 4.5 out of 5 by 75. Rated 5 out of 5 by Cyndi09 from The core of my Training As an instructor, I purchase this book as my primary training tool. I have been an instructor for 20 years. The book still has great features and solid information for participants taking the course. Most want to own the book and buy it for themselves. I give it as an incentive to participants who pay on behalf of their employees as a reference manual. I miss some of the earlier graphic injury photos, some of them were really good, although the current ones are OK too. Ultimately, I love the book! Rated 5 out of 5 by Dan_ from The manual is very informative I am still reviewing my new First Aid/CPR/AED manual but so far there is a lot of good material, informative with color photographs. Very helpful. Rated 4 out of 5 by jack6 from Great First Aid course ! Found the first aid course a great experience, and learned a lot , great teacher ! Rated 5 out of 5 by IanASM from Great Course Supplement The book covers everything in the FA/CPR/AED course and is great to have the notes to refer to, acts as a good refresher. It would have been better if the notes had been included, and handed out when we attended the course. Rated 5 out of 5 by mikara from Very informative! I definitely recommend buying this manual if you are taking the class. It is a very handy resource to remind you of what you learned in class.